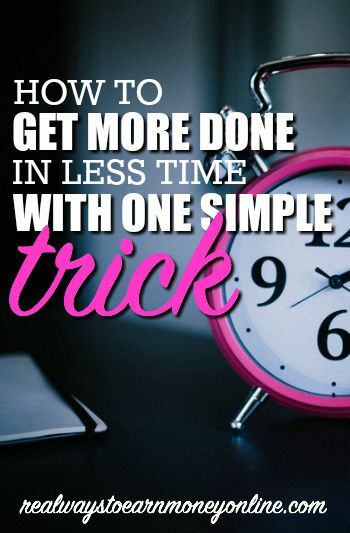 Struggling to Manage Your Time? Try the Pomodoro Technique! Published October 21, 2011 By Anna T. This post may contain affiliate links. Regardless, I only recommend sites I've researched and/or used and trust. If you're already working at home, you probably know how easily it is to become distracted by … well, pretty much everything else. Facebook (the #1 culprit these days). Your email. Twitter. Just interesting stuff you'd rather look at online than do any work. The end result is that work takes 2 to 3 times as long as it should because you spent so much time just goofing off. I know because I've been there and I'm there every day. What I'm about to share with you is the Pomodoro Technique. It was invented by Francisco Cirillo in the '80s and it is practiced by professionals and working individuals worldwide today. Work for 25 minutes without stopping. Work another 25 minutes without stopping. Take another 5 minute break. Do this again two more times. The end result should be four 25 minute work sessions and four 5 minute breaks. After the fourth 5 minute break, your next break should last 20 minutes. Start the entire process over again. The end result here is that you're getting work done and goofing off online less. You'll have to find that discipline within yourself. But if you do this for a while, you will start getting used to it. For example, you might to look at how much money you earn in “Pomodoros”. Like you might start to figure out that each Pomodoro is worth, say, $7 or 8 depending on how much you make per hour. This way, you can start scheduling your work around how many Pomodoros you need to do. Each 25 minute work session is one Pomodoro. From what people have told me, doing things this way is a huge help. For example, many people spend 10 hours trying to get done with 6 hours worth of work thanks to their distractions. I can vouch for that. I know how much time I spend goofing off versus how much time I spend working actually amounts to. The work would get done faster if I followed this technique religiously. The research behind this technique suggests that the human mind works better and much more effectively if it gets regular “mental breaks”. So the little breaks you get with the Pomodoro technique are there to kind of recharge your batteries. If you work non-stop for more than a 25 minute stretch, you may start to get sluggish. Your work quality might also slow down. This equals less money ultimately. Just use a regular old kitchen timer and set it to 25 minutes. Another option is a popular app, Focus Booster. I do realize the Pomodoro Technique might not be ideal if you have a work at home job not allowing for regular breaks. The Pomodoro Technique probably works best for writers, editors, transcribers, virtual assistants, and other professions where you work when you want to work and break when you want to break. But if you can, just try it out. After all, doesn't making the money you need to make in less time sound like an attractive idea? I am really excited to start doing this myself. Please share and let me know how it's going for you, and I'll do the same after I've tried it for a bit. Update: Tried this today and it worked out really well! I was done working much sooner than what is normal for me. Although there was temptation to interrupt my “pomodoros” and check email, Facebook, etc., I didn't. I just waited till it was time for my breaks. If you'd like some more information on how the Pomodoro Technique works, there is a highly-rated e-book about it on Amazon here that you can download for your Kindle and read through. Nice technique, using it a lot. Oh cool! I imagine that would make it more fun! I really recommend trying it out! I tried it and noticed a huge increase in my productivity. Hello Anna, I will need to try this technique. Right now, I have very few breaks. Thanks for stopping by. I look forward to reading more of your posts! You’re welcome! I actually tried this again yesterday and got done with my work by 1:00 pm, which was nice! OOOH!! I NEED to put this into action!!! It really helps a ton if you can stick to it! I definitely would benefit from this technique. I’m so easily distracted by the Internet, Twitter, Facebook, the news. You name it. I know I would be so much more productive if I was on the clock. Me too Lisa! Facebook and my email are the main problems for me. And checking my site stats! Although I had no idea this technique had an actual name, I have been using the focus booster and doing pretty much what you suggested. The only difference is that I tend to work 30 to 40 minutes with a 10 minute break and I never change it up.. I love my focus booster and find I can not work without it. Yeah I’m pretty sure it’s OK to customize it to suit yourself too. Like you said doing 30 to 40 minutes with a 10 minute break. I think the main point of it is just work non-stop for a bit, take a short break, the work again for the same length of time. If you are carefully tracking your break time and being careful not to go over a certain number of minutes, you will get more work done. Since I have kids, I sometimes get interrupted during my pomodoros but that just is how it is. Even so, I find I am getting more accomplished than before. I went to the site and downloaded the e-book along with the other resources. I only wish there was way I could transfer it to my kindle! I’m really looking forward to seeing all I can do and learning more about this technique 🙂 Thank you!!! Good luck Katie! I am so glad to have found it myself. It is knowing that I have done with my work and now there’s actually some free, stress-free time. This sounds like something I should try! I worked from 10 AM to around 10 PM yesterday … made $88.13, but that’s only like $8 an hour! I need to limit the distractions that I have, so I think I might try this one out!!! That is my same problem Katie. I try to do $75 a day Mon-Thurs and it takes me from morning till night to get it done. It should NOT take that long, not if I’m avoiding the things I should be avoiding. Doing things this way ensures that I get my work in while still allowing me several mini-breaks in between, but then I have to get right back to work. Good luck Erica! I hope your results are as good as mine were with it.